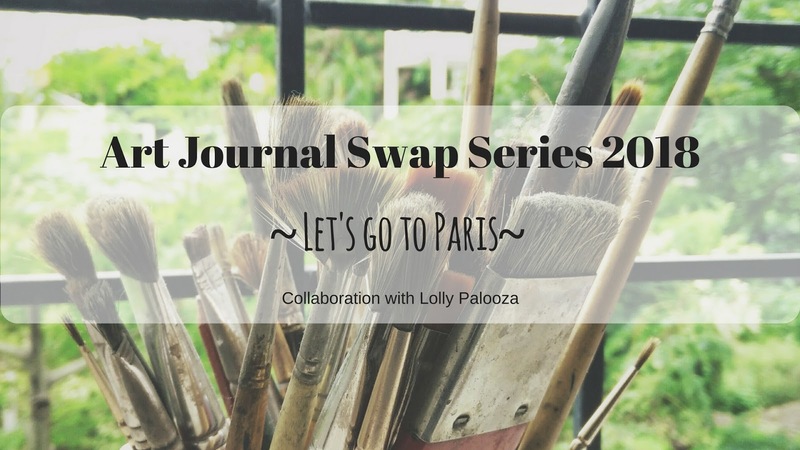 So excited to be starting off this Art Journal Swap Series with my good friend Lolly Palooza!! Lolly sent me some die -cuts at the start of the year and our aim is to swap an entire art journal filled with wonderful art for 2018. I used her Eiffel Tower die-cut and went to work inspired by this image which I found on google. I used Dina Wakley Scribble Sticks to create the background and after a few trials and tribulations (you will have to catch the video to see what Im talking about) - I was pleased with the final outcome. Look at that gorgeous full moon!! Catching some of the flourish stamping in the background plus that lovely gold embossing. The bottom of the Eiffel Tower which gave me such grief in the process video. Should I have left it at that first stage or given it a go?